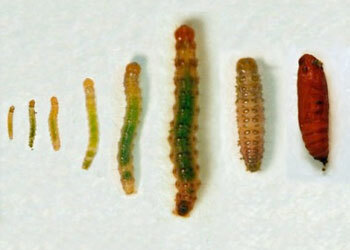 Several species of sod webworms or “lawn moths” commonly infest home lawns. These include the silver-striped sod webworm, the bluegrass sod webworm, and the larger sod webworm. Sod webworm adults have siphoning (straw-like) mouthparts, are dull-colored moths with a wingspan of ¾ to 1 inch, and their front wings frequently are whitish, dull gray to tan-brown, often with longitudinal stripes and other markings. The most severe damage usually occurs in July and August. Larvae chew off leaves and stems just above the crown. As webworm larvae continue to grow and feed, the injured areas enlarge and coalesce into big, brown patches.